When George IV of England was still the Prince of Wales, he fell in love with a commoner and a new fad in jewelry was created…or so the story goes. Actually there are a number of different stories about the origin of Georgian “lover’s eye” jewelry but most of them center around George’s love affair with the twice widowed Mrs. Maria Fitzherbert, the passion of the royal heir’s life. miniature painting of her eye to wear so no one would recognize her identity. Bear in mind this was an era in which men wore lockets with miniatures around their necks, in rings, on their watch fobs, in studs and in their fausse montres*. Another version of the story suggests that the Prince retained the famous miniaturist Richard Cosway to paint the right eye of the prince for a locket he gave to his paramour in 1785. According to noted British Jewelry Historian Shirley Bury in her book, Jewellery Volumes I and II, the eye miniature was sent to the widow with a letter proposing marriage that was dated November 3, 1785. Still other stories offer the explanation that the Prince and Mrs. Fitzherbert exchanged eye miniatures set in octagonal-shaped rings and yet another story reported by Shirley Bury relates the following: Although secretly married to Maria Fitzherbert, George married his cousin Princess Caroline of Brunswick in 1795 in order to get Parliament to help pay his debts. After the birth of their child Princess Charlotte of Wales they parted and he reconciled with Mrs. Fitzherbert. Bury says that as a means to let her know he was sincere he sent her a copy of his will showing he was leaving her all of his personal possessions. Accompanying the will was a gold bracelet set with a locket and another painting of his right eye (also said to be by Cosway) which was engraved with the motto, “rejoindre ou mourir” (to join or die). It was the Prince’s habit of wearing a locket around his neck that helped to make eye jewelry all the rage in Georgian England. The idea of a miniature portrait of a loved one’s eye was probably not his own…it is believed that a young man of affluence visited Paris and brought back a piece of jewelry of this nature to London where the prince adopted the idea and made it de rigeur for English society. 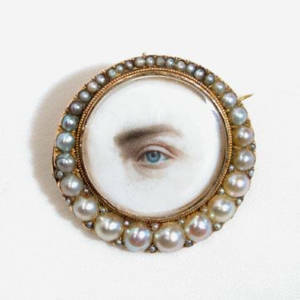 Georgian “lover’s eye” brooch with a pearl surround circa 1830. This is an unusual example because it is a man’s eye...women’s eyes are more common. Painted on ivory and having a compartment on the back which may have once held a lock of hair. The brooch is inscribed on the back “Walter Hugh Ridpath 21st July 1870 14th May 1875. The inscription would have been added later as this is most certainly of the Georgian era. It was not uncommon for cherished objects to be kept in the family and etched later for other events and sentiments. In this case the dates appear to refer to the death of a child and a lock of the child’s hair may have been kept in the compartment. The brooch measures 1 1⁄4 inches in diameter. Some of the small pearls are replacements. Photo courtesy of Lisa Stockhammer/ www.georgianjewelry.com. Whatever the origin, this form of jewelry was popular in the courts and in wealthy circles in England, Russia, France and to a very small extent in the United States from about 1785 through the 1820s. Today original “lover’s eyes” jewelry pieces are a very valuable collectible because of their scarcity and the romantic sentiment behind them. They can be found in lockets, bracelets, brooches, watch fobs and far more rare are the versions in rings. As stated earlier in this article, the original purpose of this unique jewelry was to keep the lover’s identity a secret. Eventually this form of jewelry was made as a keepsake for any loved one whether in a secret relationship or not. In fact, sometimes jewels were made with representations of all of one’s family members’ eyes. Mourning eye jewels were also made to memorialize a departed loved one and these are often in a surround of seed pearls to symbolize tears. Rare examples might also have a diamond set into the eye as a more realistic depiction of a teardrop. The tiny eye paintings were painted by miniaturists of the time who made a specialty of painting very small and detailed images. The eye was usually shown with the eyebrow and lashes. In some of these jewels a curl of hair, part of a sideburn, or the bridge of the nose was shown as well, but never quite enough to reveal the identiy of the portrait’s subject. Some eye jewels also contain a compartment to hold a lock or plait of hair. Eye miniatures are painted in delicate colors. The image often has a border of clouds around it. The more expensive versions were painted on ivory and the less expensive on vellum, but for collectors today there is no price differential—both are equally desirable. Settings could be simple, enameled or chased with gold serpents or neo-classical honeysuckle. Some settings have little panels that can be pushed back to reveal the eye miniature. In judging the value of a piece of genuine “eye jewelry” the following should be considered: how rare is the piece—rings and larger pieces are most desirable and the greater the detail of the miniature the more valuable. “Eye jewels” are usually found with glass over the painting and should never be opened or disturbed or the painting may be ruined. As the price of “eye jewels” has escalated owing to their scarcity, fakes can now be found in the marketplace. Some are made from computer images that upon close examination will be shown to have pixels instead of brush strokes. Others will be painted with murky colors to give the appearance of being old while others are just too colorful to be original. Remember that an old frame does not mean the eye miniature within is old—this may have once simply held a lock of hair. Take a good look at the bezel (the frame) to ascertain whether it has ever been opened or moved. If the miniature is on ivory try to determine if it is truly ivory and not plastic. Also, closely examine the colors and the style of painting. *fasusse montre– translates literally as “false watch” In the late 18th century both men and women wore on their right hand or at the end of a chain an imitation watch (wearing a real watch on their left hand) which had no time-keeping movement but rather held a mirror, pincushion or vinaigrette (smelling salts). Some of these pieces were made of gilt metal while high quality versions were silver or gold decorated with enamel and/or jewels.